What train was Mr Mallinson on? Was an announcement made at Aldgate that there had been a bomb on a train? Q. Could you give the court your full name, please? Q. May I ask, is it Miss O'Dell or Mrs O'Dell? "Q. Did you take Mr Henning with you, in fact, towards the rear of the train as well? A. Yes, he wanted me to hold his hand and he wanted me to stay -- he asked me to stay with him. Q. And so obviously, because he was injured, you did so? A. Mm, I was concerned there was another passenger called -- whose name was Ross, and I was worried about him, because he wasn't particularly coherent and he was quite quiet, and he was -- he had quite a bad -- what looked to me like a bad head cut. A. Somebody else helped him. Q. Could you see him being brought out? A. I didn't see him because he was behind us, but then I saw him -- when I got to Aldgate eventually, I went over to Aldgate bus station and got on a double decker bus, I saw him being helped onto -- into an ambulance. Q. So you knew he had been removed from the train? According to O'Dell's account, Ross Malinson was aboard train 204 along with Michael Henning. However, Mr Mallinson was one of the people on the list of survivors designated as Properly Interested Persons (PIPs) in the initial hearings to the Inquests, and also one that had received legal aid to be represented. Justice Hallett was later to make her ruling that PIP status for survivors was to be withdrawn and they were not to be represented at the Inquests proper, although they could be called as witnesses during proceedings. 80 The following applicants were not in the same carriage as the explosions: Michael Henning, Elizabeth Kenworthy, John Blundell, Joanne Cole, Jacqueline Putnam, Ellaine Young, Angela Ioannou, Susan Maxwell, Lesley Ratcliff, George Roskilly. Further Tim Coulson and Ross Mallinson were not travelling on the same train as the explosion, although Mr. Coulson entered the affected carriage and provided first aid. O'Dell places Mallinson on Ciricle Line train 204, yet the Inquests' own documentation states quite clearly that Mr Mallinson wasn't on that train at all. [Mr O'Connor] carriage, and thus drawing a boundary about whether you're in the same carriage or not would be arbitrary and irrational, and indeed, even not in the same train, one of our clients, madam, you will have seen suffered a very serious fractured skull requiring two operations and was actually in a train passing opposite the explosion. Such is the random impact, that it went through windows and injured her desperately seriously. As can be seen in the Trackernet image in a previous article about the events at Aldgate, there appears to be no train 'passing opposite the explosion' on Circle Line train 204. Mr Mallinson was on his way to work as a computer programmer for an insurance company at Tower Hill when Shehzad Tanweer, 22, detonated the bomb on a train between Liverpool and Aldgate stations on the Circle Line. Minutes later, Mr Mallinson's train, also on the Circle Line, began moving again, slowly passing Aldgate station, where an announcer warned passengers that there had been a bomb on a train, probably the one directly behind Mr Mallinson's. His train continued to Tower Hill station, where two police officers carried him to the surface. He gave his mobile phone to a woman next to him and asked her to call his wife, Judy. This would have huge implications if indeed this account is true. Firstly, the announcement at Aldgate of a 'bomb' whilst all the accounts heard at the Inquests this week have referred only to an 'electrical explosion' or 'power surge' in the first moments after this event and secondly, that the power was indeed on or had been reset after the explosion on train 204. The tracks would have to have been live after the explosion. Not a word has been heard at the 7/7 Inquests of any other train 'moving' at Aldgate or in the vicinity of Circle Line train 204, apart from a Metropolitan Line train 447 which was going in the opposite direction and had only just begun to leave the station from platform 2 before it stopped suddenly. There has certainly been no mention of the explosion impacting 'through the window of a passing train' onto Mr Mallinson as referenced by his legal counsel, Mr O'Connor. [Statement of MR MARK WILLIAMS] read "I then got on to train 447, which again is a Metropolitan Line train which was running on time. As I pulled away, I heard an extremely loud bang. At this point, I was about half a car length out of the station. I immediately stopped and, at the same time, the Underground electrical traction current turned off and the lights in the tunnel turned on. I did not open my doors as I was unsure of exactly what had happened. I then heard shouting from the station staff on the platform and the doors were being opened by two other train operators, Eldridge and Paul Haskins who were manually opening the doors. I could see this train was facing me in the tunnel, as it had just turned the corner. This was a C stock style train. I then went back through one car and got out of the train and joined the two other train operators, Eldridge and Paul Haskins. Metropolitan Line train 447 appears to have been evacuated within 3 to 4 minutes and well before the evacuation of Circle Line train 204. [Statement of Mr Robert Whyte, dated 8/07/05, read] "Myself and PC Hatcher, along with the cycle officer, attempted to break open the door of the next carriage along from the badly damaged carriage. We were not successful in doing this. We then attempted to locate some sort of metal object that could help us in our effort to open the train doors. We could not find anything that could help us. "I then helped a male, who had a very severe head injury, who was holding a piece of bloodstained cloth tightly on the side of his head. The male, who I now know to be Ross Charles Mallison. He was shaking and kept telling me he was very faint. I took the male's small suitcase in one hand and told the male to put his arm around my shoulder for support. I told the male it would be a short walk to the platform where we could get him some medical attention. I kept trying to reassure the male along the entire walk of the track. I walked the male to the exit of the station where I was joined by a firefighter. This firefighter took the male by the other arm for more support. I was informed by this firefighter that they were using double decker buses across the road as the places to sit down injured people. Myself and the firefighter walked the male over to the buses. We sat him down on the first bus. The firefighter then asked if I was okay. I said I was. The fireman then left. I asked the male to sit back down and try to relax and try to take deep breaths. A male sitting behind me then handed me a piece of clean cloth. I replaced the man's cloth he had on his head with this piece of fresh cloth. A paramedic then came over and spoke to the male. He asked how he was feeling. I then asked the male if he was okay and he said 'yes' so I left the male in the hands of the paramedic on the bus. "At this point, I decided to head back down into the station and try to help anybody else that needed help. Once again, I went into the station, headed downstairs to the left and on to the track. I came across a male and female that needed some help. I believe that they were boyfriend and girlfriend. How curious that Mr Whyte was able to include the full name of Ross Mallinson apparently on 08/07/05 whereas he doesn't name the 'male and female' to whom he also gave assistance. Neither is there any mention of the place from which Mr Mallinson was rescued and aided. Nor any mention of him being rescued from a different train to Circle Line train 204. In fact, O'Dell's account places him on the very train that the Inquests' documentation claims he wasn't. It may be worth noting at this stage that Miss O'Dell gave a statement in July 2005 and was asked by Lady Justice Hallett to prepare another statement, over five years later, in August 2010. The fact remains that the evidence adduced to the Inquest from Mr Whyte & Ms O'Dell differs greatly from the original account of Mr Mallinson's that he gave to The Age in July 2005 and that Mr O'Connor QC submitted to the Inquest. Mr O'Connor QC had no option to question or challenge these statements on Mr Mallinson's behalf, since survivors such as Mr Mallinson are no longer legally represented at the Inquests. Two weeks into the 7/7 Inquests and we've heard about the strange lack of CCTV footage of any of the four accused from the day, the even stranger account of the police investigation which led to the car park in Luton before the accused had been identified at King's Cross Thameslink station, the lack of interest in pursuing and interviewing a 'fifth man' and now we have the strange case of a Jaguar at Luton that seems to appear there at the same time as the accused on both 28 June 2005 and 7 July 2005. Before the Inquests started no CCTV footage had been released showing how three of the accused, Khan, Tanweer and Lindsay, made their journey to Luton Station on 28 June 2005, a journey touted as a dummy run or rehearsal for 7/7. A Freedom of Information request submitted by J7 asking for precisely these details was refused by the Home Office. 65. There appears to have been at least one recce visit to London on 28 June by Khan, Tanweer and Lindsay, but not Hussain. They made a similar journey from Luton to King’s Cross early in the morning and travelled on the underground. They are picked up on CCTV near Baker Street tube station later in the morning and returning to Luton at lunch time. Lindsay was later found to have a chart of times taken to travel between stations which he might have written during this recce. Tickets found at 18 Alexandra Grove also suggest visits to London in mid-March. 66. Other things suggest discipline and meticulous planning with good security awareness including careful use of mobile phones and use of hire cars for sensitive activities associated with the planning of the attacks. There are some indications that Khan was worried about being under surveillance during this time. At some point in early 2011, the Inquests will hear the evidence regarding how the events of 7 July 2005 were investigated, so it might be worth bearing in mind events that occurred in Luton car park on these two days. Perhaps the Inquests will also help explain why men so 'worried about being under surveillance' would hang on to their tickets from a journey to London in mid March, and also how these tickets came to be found in 18 Alexandra Grove, the alleged 'bomb factory', a location that apparently wasn't used until June 2005, some three months later. [MR KEITH] Turning to the CCTV which appears to be the object of the substantial bulk of the claims, there is nothing to suggest that, where there is CCTV missing, this reflects anything other than the fact that many CCTV systems do not continuously record. Where there is CCTV missing, Mr Keith? 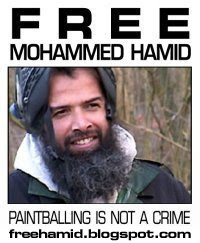 Such as King's Cross underground station, the McDonalds visited by Hasib Hussain, the number 91 and 30 buses that Hussain is alleged to have boarded, as well as at significant moments in Luton station car park on the morning of 7 July 2005. Whilst we have no evidence to suggest that there is anything sinister about the coincidental movements of a dark-coloured Jaguar at Luton station on the mornings of both 28 June 2005 - the 'rehearsal' - and 7 July 2005, there is plainly evidence of more than a lack of 'recording continuously'. What precisely is being cut from this footage, and Why? An animated panel that cycles through images 1 & 2. J7's submission to the Coroner, detailing questions and anomalies that have arisen regarding this event, can be downloaded here. and our analysis of the events at Aldgate can be viewed on the J7 website here. The first scene under scrutiny is Aldgate. Compared to the first week of the inquests, this second week has been particularly harrowing, hearing the reports about those who died and the stories of others who were severely injured. Tales of humanity and heroism have also emerged, along with inspirational accounts of overcoming horrendous injuries. "When the device on the train between Liverpool Street and Aldgate stations exploded, it damaged three power assets, an 11-kilovolt feeder cable number 642", which is the feeder cable to which I made reference in my opening "running along the tunnel wall and its associated pilot cable, pilot number 62, and a signal main cable between Moorgate and Tower Hill which provided the power for the signal supplies between Moorgate and Aldgate. "The danger to the number 642 feeder cable caused the 11-kilovolt electrical feeder to trip at Moorgate substation at 08.48.40. This in turn caused the 22-kilovolt coupling transformers, which supply the Mansell Street distribution network, to trip at 8.49.02. This caused widespread power disruption to a significant area of the London Underground network." We'll let Mr Keith off with the 20 seconds between the "11-kilovolt electrical feeder tripping at Moorgate substation at 08.48.40" to allow him to remain confident of his opening statement, after all, what's 20 seconds in the grand scheme of things? Perhaps he has a pressing need for this first event on 7 July 2005 to have the significance of occurring at 11 minutes to 9? "... and would explain that the times referred to are approximate times recorded by the power control operation in the handwritten logs. The times I have referred to are the actual times extracted from the power system computerised event logs. 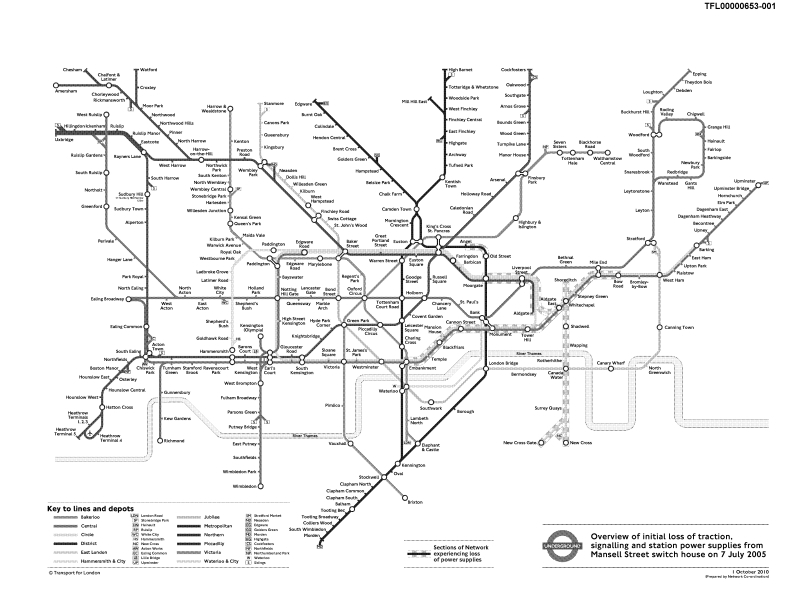 "In summary, the times recorded by the power control room are 08.49 in respect of Aldgate East, 08.49.43 in respect of Edgware Road and 08.49.52 in respect of King's Cross/Russell Square." 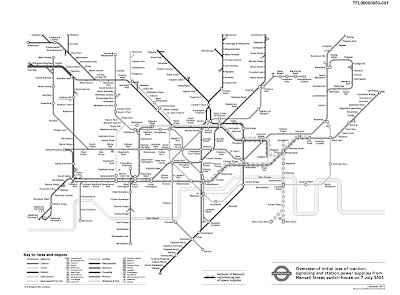 London Underground runs a train monitoring system called Trackernet. TrackerNet is one of London Underground's key operational systems that monitors the whereabouts of every single underground train on the network. The system received a lot of coverage earlier this year when TfL lifted all restrictions on the commercial use of its data and provided access to real-time train information. "You can see what has happened is the track circuits on all of those other lines, you can see the orange lines indicate that an event has occurred to trip out the power system. And that was almost certainly the blast. And this software allows us to confirm the timings." My Lady, we don't have, in fact, a trackernet image for the eastbound Circle Line train, but in respect of train 216, its last movement was timed at approximately 8.49.46 and we have a trackernet image for that train. 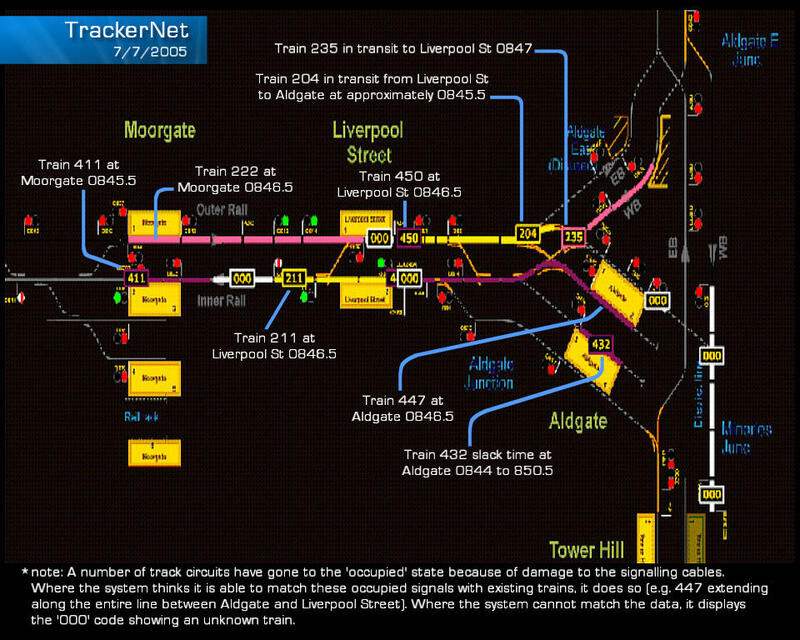 Quite what the Trackernet image for train 216 at Edgware Road has to do with the Provisional List of Factual Issues, 3 and the "Circumstances at Aldgate immediately following the explosions" only Keith knows. After five years of dedicated and dogged research J7 might hazard a guess that the reason for this could perhaps be that the explosion didn't actually occur at Aldgate at 08.49, despite all Mr Keith's efforts to make it so. This Trackernet image of the time of the explosion has been annotated by J7 using the Working Time Table for the London Underground, which we obtained through a Freedom of Information Request. 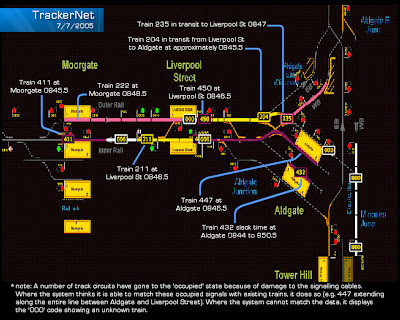 The information it contains may well be the reason Mr Keith hasn't shown any Aldgate Trackernet images at the 7/7 Inquest. Circle Line train 204 has left Liverpool Street and is in the tunnel on its way to Aldgate station. All other trains in this image are also in their correct places, according to the Working Timetable, if the time of this explosion is 08.46.30, the time that train 204 was in transit to Aldgate, not 08.49. Unless all these trains were running late on the London Underground, Circle Line train 204 would have been in transit between Aldgate and Tower Hill at 08.49. Train 204 appears to have been running on time; a FOI Request to TfL, asking for the time that it was at King's Cross received the response of 08.35 - corresponding to the timetable. 7th July 2005 CCTV of explosion at Liverpool Street station from J7 Truth Campaign on Vimeo. A. [DI KINDNESS] This footage will show the frontal view of the 204 train number, Circle Line train pulling into Liverpool Street station, and it's coming towards the camera at the moment. Q.MR KEITH] Officer, this is Liverpool Street. It stands to reason that the bomb, if it entered the train at King's Cross, is already on that train. Q. As is the bomber. A. That's correct. This image shows the last -- the first carriage of the train. Q. The timing in the top left-hand corner, although the CCTV itself shows 07.44, did your researches show that, in fact, the CCTV system itself was one hour and three minutes slow? Q. So we mustn't be misled by that timing. The timing of this is, in fact, 08.47 or thereabouts? Incorporating the adjustment for British Summer Time, Circle Line train 204 leaves Liverpool Street at 08.45.40, and the explosion happens (according to the smoke & passengers running) at 08.46.35. (Note: There are 39 seconds of footage missing). This is exactly the time estimated by J7 for this explosion according to the Trackernet image, evidence which Mr Keith has chosen not to exhibit. LADY JUSTICE HALLETT: Sorry, can we just go back? The time of this second call? MR KEITH: According to the transcript, my Lady, it's 08.52.40. There has been a certain degree of confusion, I think, in the past as to whether or not that time indicates the beginning or the end of the call. These transcripts have been revised now a number of times to reflect the accurate time of each call. My learned friend Mr Gibbs might be able to assist in relation to whether or not that time indicates the beginning or the end of the call now. MR GIBBS: It indicates beginning of the call. MR GIBBS: That's right. Whether that timing is accurate is a matter still of some conjecture, but that is the timing that we have. LADY JUSTICE HALLETT: Well, Mr Baker, on the question of timing, given we know what time the explosion occurred, does 08.52.40 seem to be about right for when you made the second call? A. [DI BAKER] It does. We were there pretty much instantly and trying to ascertain what was going on, so it was merely a few minutes. LADY JUSTICE HALLETT: Thank you. MR KEITH: My Lady, if it assists, may I just refer you to the Aldgate time line, which is at INQ10426 [INQ10426-1]? The first entry you may recall from the opening is at 08.47.38, which is a BTP call from London Underground, but we know from the absolute time at which the explosion occurred, which was 08.49.00, that that call, which is taken from the same exhibit, BTP167 must therefore be about one minute and 40 seconds out, and that is our best estimate as to the accuracy of those transcripts. LADY JUSTICE HALLETT: So if that was right then this call is about 08.54? Editing transcripts? Adjusting CCTV timings? Withholding Trackernet images? All to make the 08.49 timing fit? Fixing the evidence to fit predetermined facts? Whatever next? The explosion at Aldgate on Circle Line Train 204 DID NOT occur at 08.49. It occurred between 08.46.30 and 08.47. After just two weeks into a five month hearing, can anyone have any faith in this Inquest process? Accounts of power surges and electrocution and whether Shehzad Tanweer was actually sighted on train 204 to follow. Originally posted on the J7: 7/7 Inquests Blog. In the opening week of the 7 July Inquests, we have heard from the witnesses mentioned above who claim to have seen a fifth (and in some cases a sixth) man - and the Home Office Narrative's claim that the man was a “regular commuter” seem odd at best – and misleading at worst. The witnesses in question include Sylvia Waugh, who believes she saw the men outside the flat in Alexandra Grove, Leeds where it is claimed the bombs allegedly used on July 7th 2005 were manufactured. There is also Susan Clarke, who believes she saw the men in the car park at Luton Station. Joseph Martoccia was the witness whose statement to the police in July 2005 regarding his believed sighting of the men at King's Cross station was mutated by the media into a CCTV image, so successfully, that even a former newspaper editor appeared to believe he had actually seen such an image. Yet, as detailed in this previous post, no such image ever existed. This however hasn't stopped it being described as "iconic" and even the Press Complaints Commission agreed that an image that doesn't exist and hasn't been seen by anyone is still perfectly entitled to be described as an "iconic image". Q. [Mr Patterson] "One car had one or two males in it. The other, a lilac-coloured Nissan, had four males leaving it, all carrying rucksacks. When asked, she described all the males as not white." A. [Susan Clarke] He then goes on to say that you handed him the piece of paper that you've told us about. Q. So pausing there, is that an accurate note of what you told the officer on that Tuesday? A. As far as I remember, yes. Q. Have you marked X as the spot where you came across a group of men? Q. Do you recall how many there were? A. Yes. At the time, I said between four and six. I wasn't entirely certain of the number. Mr. Martoccia goes on, however, to say that the men caught his attention because they were in a huddle. It was this behaviour that led him to initially deduce they were probably a sports team. Interestingly, although Mr. Martoccia contacted the police the following day, he was not asked to identify the men from photographs until almost a year later, a somewhat odd approach in what was termed by Sir Ian Blair as "the largest criminal inquiry in English history". When shown a picture of Jermaine Linsday during his testimony to the Inquests, Martoccia stated that he did not remember seeing him. Moreover, Martoccia said that the man he saw heading towards the Piccadilly line – who, one would presume on the basis of the official 'narrative', would be most likely to be Lindsay, who stands accused of causing the explosion on the Piccadilly line train – was instead Hasib Hussain; the man accused of being responsible for the number 30 bus incident. Q. You're probably aware, Inspector, of why I'm asking you these questions. Presumably you were told that there's a witness, Susan Clarke, who told the police quite early on that there may have been more than four people in and around those two cars. Were you aware of that? Did you look for the number of people around those cars? A. Yes, at the time, when we were viewing the CCTV, we were comfortable with the amount of people that were there and that we'd managed to track them to the position where we got decent CCTV images that we could say, yes, there are that number of people. MR PATTERSON: If we pause it now, perhaps. Can we see four figures walking off, Inspector? A. Yes, we can, yes. Q. Is there a figure who hovers and lingers between the two cars for a period of time? A. Yes, there is a person there, yes. I think that's the person that exited that vehicle that just arrived. A. The individuals around the car were -- their movements were assessed, yes. Q. Is that something that you dealt with or that somebody else dealt with? A. I didn't personally follow this individual away, no. transcript today, lines 10 to 14. That was referring to that footage of Luton rail station that we've referred to earlier. Can you just go to page 2 of this document, Inspector? Q. Can you see the entry at 7.19 about halfway down the page? This is an entry by DC Stephen Bain who was viewing it on 10 or 11 July. Can you see at the end of that entry at 7.19, after he describes four persons at the rear of the vehicle, he says: "Fifth person remains at vehicle, movement between both, fifth person towards Luton station, distant view." Then a little further down the page, 7.23: "Fifth male through ground level barriers from car park", and there's continued references to the fifth male there, so two more entries at 7.23. So did you discuss with DC Stephen Bain the fact that, on viewing the footage, he had originally thought there were five males at the car? seen when we've viewed it that there is a fifth person that arrives. The officer has noted it in his log and he's tracked him to the station. A.I can't recall if we discussed it in those terms, but we were certainly looking at the movements around the vehicle and identifying fully how many people of relevance to us were there and, certainly, others who were sighted we were looking to eliminate in terms of movements with the four bombers. In his opening statement to the inquest, Hugo Keith QC confirmed that a rucksack containing “four further improvised explosive devices” was found in the Nissan Micra, plus eight other devices. Why were devices put into a rucksack if not to be carried by somebody? This question, and the question as to why all three witnesses who claim to have seen the men at various stages en-route to London numbering between four and six men each time, it appears, are not of concern to the counsel to the inquest. Indeed, both Hugo Keith QC and Lady Justice Hallet's attitude to Mr. Patterson's questioning regarding the matter, gave the sense that suggesting that any more than the four men were involved is a subject completely untouchable by the inquest. The Narrative claimed in 2006 that “there is no evidence of a fifth bomber”. In fact, as shown by the evidence given under oath to the Inquests, there is "evidence of a fifth bomber". But, much like “the war” in Basil Fawlty's hotel, nobody is allowed to mention it. J7 7/7 Inquest Blog: The Final Curtain - "CCTV rich" to "CCTV FAIL!" "In the next image, this is the last sighting of Lindsay, Khan and Tanweer. This was the first CCTV sighting that we had on the unit on this enquiry as they pass through towards the underground station." Q. [Hugo Keith QC] Can you recall on what day you first spotted a number of men walking through the King's Cross area, in particular through the Thameslink station carrying rucksacks? A. [Detective Inspector Ewan Kindness] It was on 11 July 2005, sir. On Day 4 of the Inquests it became clear that the image above was the last piece of CCTV, according to the Metropolitan Police, that exists of the four accused together anywhere near King's Cross underground station and also the last of Khan, Tanweer or Lindsay. CCTV footage of Hasib Hussain outside King's Cross was shown to the Inquests and released to the press. 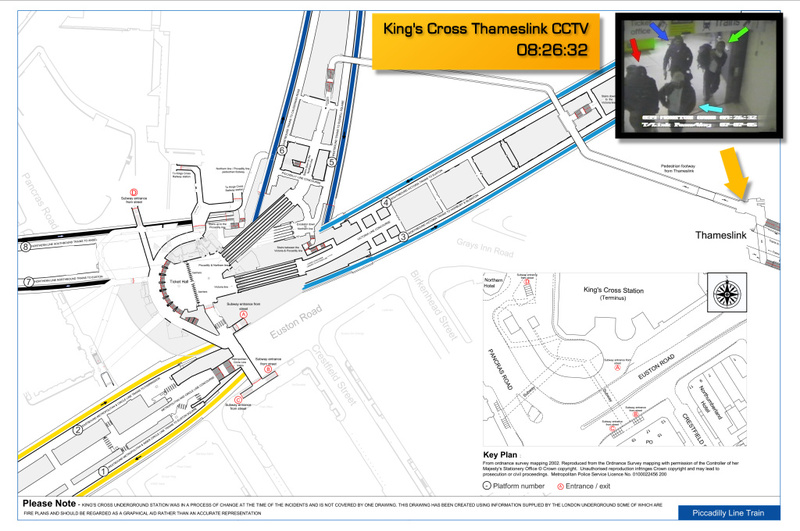 However, no other footage exists, we are told, that shows the movements of Khan, Tanweer or Lindsay after the King's Cross Thameslink was captured. Why not? Especially when on 11 July 2005, Deputy Chief Constable of the British Transport Police, Andy Trotter, boldly announced, "The Underground network is a CCTV-rich environment". The exchange below, between Mr Patterson QC, counsel for the bereaved, and Detective Inspector Ewan Kindness, provides further details. Details which only become apparent to keen listeners in attendance at the Inquests or eagle-eyed readers of the transcripts because, as usual, major show-stoppers in the official "narrative" of 7/7 are regularly and completely ignored by the press. MR PATTERSON: Officer, we then watched the footage -- and I don't think we need to play this, thank you -- of the men entering the railway station. In fact, we don't actually see them buying tickets, do we, in the footage? Were you able to find any footage or CCTV evidence that helps to explain how they got their tickets? A. [DI EWAN KINDNESS] I can't recall the tickets being purchased. Q. Then in terms of the journey south, I think you told us that there were no cameras on board the train, is that right? Q. When they got to King's Cross, in terms of the available footage, although there were quite a few cameras at King's Cross station, is it right that the only cameras that were recording for the relevant time was a camera in the tunnel? A. There were 76 -- it was a temporary system. King's Cross underground had a temporary system in place. 76 cameras moving in sequence from one second at a time. Fortunately for us, at the appropriate period, between 8.30 and 8.50, it sat for 20 minutes on that one camera and that allowed us, at that period, they came through and we got the first sighting. Q. Is there any footage of the mainline station as opposed to the Thameslink station? A. When you say "mainline", do you mean mainline King's Cross? A. At some distance away? Q. Yes, is there any footage, CCTV footage -- you referred earlier today to many, many hours of footage that would be relevant to the emergency response. A. I mean, King's Cross mainline footage was that which Hasib Hussain has been identified on, so that's some of it. Of course, it's quite a large estate, but there is definitely King's Cross mainline footage. Q. So if anyone wants to look at footage of the platform or of the escalator, there is footage that has survived of all of those different areas of the mainline station? A. I would -- I mean, we'd have to check the schedule, sir, but from my understanding, that would have been seized and certainly was viewed, so it would be accessible, yes. A. Could you just provide me a little bit of information about what he sighted, sir, just to refresh my memory? A. Certainly euphoric, but, no, there was nothing, we looked for that, sir, and there was nothing at all. Q. That wasn't covered by cameras? Q. In terms of the platforms and the Circle Line heading west and the movements of Mohammed Sidique Khan, presumably you looked but that wasn't covered? Q. -- but there was no coverage of him boarding the train? 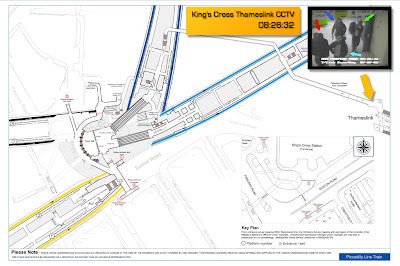 From this we learn that "a temporary system" of 76 cameras was installed at King's Cross, but that it malfunctioned for 20 minutes between the crucial period of approximately 8.30am - 8.50am on the 7 July 2005. This "malfunction" left just one of 76 cameras actually recording CCTV footage. Fortunately for the investigating officers, the one camera which remained in operation happened to be the one which was trained on the tunnel between the King's Cross Thameslink station and King's Cross mainline station. This one CCTV camera captured the image shown above. Note: The account of this image being the key that led the investigation back to Luton station has been thoroughly discredited under questioning by Ms Gallagher QC, counsel for the bereaved. This is examined in detail here. There is no CCTV from the ticket gates, subways or platforms showing any of the four accused at King's Cross. Over to the questions. The first question was from a man who lost his boyfriend at Russell Square who wanted to know if there were CCTV images of the bombers on the trains, and whether he could see the last minutes of his loved one. The Counter Terrorism representative said that there were, but they had not been released, as the post-bomb CCTV images 'were disturbing'. Dr. Reid promised to investigate whether images of the train before the bomb could be shown privately to the bereaved man. It sounded like the CCTV images were not of good quality. If DI Kindness' statement is correct, and the image shown above is the last sighting of Khan, Tanweer and Lindsay, any footage that might exist from the trains will not show any of the three accused. So, what about any other crucial CCTV from the events of 7 July 2005 that might go some way to proving that the four accused were actually on the trains and the number 30 bus? There are reams of footage showing Hasib Hussain in and around King's Cross and the Euston Road, but what about the footage from Hussain's infamous trip to MacDonalds, where it is claimed he inserted a 9 volt battery, purchased minutes before from W.H. Smith, into his 'malfunctioning explosives'? Q. Finally this, Inspector: the movements of Hasib Hussain, you've shown us the various bits of footage of his movements and of the buses. Was there any footage from inside McDonalds restaurant where he seemed to be present for some 8 minutes? A. There was no footage. We recovered the CCTV from McDonalds, but unfortunately the system was -- the recording was stopped prior to him going into that location. Q. So there were cameras, but for some reason they weren't recording? A. There were cameras and, in fact, you see the office manager in the office going to the video machine and switching the "stop" button and it stops. How about footage from the Number 91 bus that Hasib is alleged to have boarded before allegedly switching to the Number 30 at Euston Station? Q. Then finally the buses. The number 91 bus that he was believed to have taken along the Euston Road, no cameras inside that bus? A. I can't recall the reasons why, but it was a main priority for us to find him on the bus, as you can see by our actions on the night of the 7th, to get the route 30 bus footage to identify him. So when we had the witness statement stating that -- the 91 bus, that was a priority for us to identify it and, for whatever reason, we didn't identify that footage. So I can't say at the moment whether that was malfunctioned or it wasn't there, it was recorded over, but for one of those reasons why we didn't have access to it. A. The route 30 bus had malfunctioned earlier in the year, so we identified it that night, we viewed it that night at the laboratory, and it showed footage from earlier in the year, nothing of the date in question. So, no footage of Hasib Hussain from the Euston Road boarding the Number 91 bus, nor is there any footage from Euston station of him boarding the Number 30. For over five years J7 have been calling on the government to 'RELEASE THE EVIDENCE" but, as a result of the revelations during the first week of the Inquests, perhaps we need to change our demand to, "WHERE IS THE EVIDENCE?" Q. Can you recall on what day you first spotted a number of men walking through the King's Cross area, in particular through the Thameslink station carrying rucksacks? A. Indeed, sir, yes, and we were looking at the route of the -- the Thameslink route up through Bedford and Luton and looking for fast-time CCTV recovery of those stations to see where the bombers had access to rail network. A. We were able to identify all of the men had accessed -- the four men had accessed via Luton railway station. Note that DI Kindness is neither asked for, nor offers, any explanation for why Luton was chosen from at least eight possible stations that the 07.00 Bedford - Brighton Thameslink train would have stopped at on the morning of 7 July. Any investigation looking for potential al Qaeda "suicide bombers" would perhaps concentrate their efforts instead on Luton Parkway station, with its links to Luton Airport, and one stop closer to London than is Luton station. Eight stations would have furnished a lot of CCTV footage to examine within a maximum of 24 hours between the identification of the four men on the 11 July 2005 and the Luton link on the 12 July 2005. 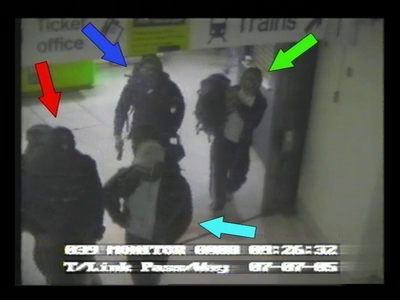 One theory, indeed the one favoured by the Home Office narrative, is that Luton was chosen due to the witness sighting of four men putting on rucksacks at Luton station, as received on the 12 July 2005. This witness, Susan Clarke, gave her evidence to the Inquest during the afternoon session of 13 October 2010. She describes handing a note of the cars she had seen at Luton station on the morning of the 7 July to a British Transport Police officer at St. Pancras station. This note was handed over on Tuesday 12 July 2005. [Transcript, 13 October 2010, afternoon session - page 14, line 14 on]. Officers attended her place of work at 11.45am on 12 July 2005 and Ms Clarke was interviewed for two and a half hours at Holborn police station. So this would appear to be how the Luton station CCTV came to be favoured and examined over and above seven other possible stations of focus. Or, at least it would be if either the narrative or DI Kindness were actually relating the facts of the matter. Fortunately for the bereaved and the wider public, the carefully plotted course of Mr Keith's questioning was exposed by further questions interjected by Mr Patterson and Ms Gallagher, the counsels for the bereaved. However, nobody would be aware of this through reading any of the press reports covering the inquest proceedings. LADY JUSTICE HALLETT: Strict rules of evidence, you're obviously right, Mr Hill. Do I take it, to try to cut this short, Mr Kindness, that essentially you were responding to somebody -- somebody else has got information and they've said, "All right, Detective Inspector Kindness, off you go, we want you to look at Luton and Bedford", is that really -- or did the information come to you personally? A [DI Ewan Kindness]. The information -- Luton and Bedford was seized, my Lady, as a result of the sighting at -- as a result of the sighting at King's Cross Thameslink which had been generated by the CCTV viewing by the CCTV team. So it was natural that we would follow the route up the line. It's as simple as that. A. [DI Ewan Kindness] That's correct, yes. Q. In that document which I've made reference to, I think you have it before you, my Lady, the Anti-terrorist Branch SO13 record -- do you have that document before you? A. No, I don't, no. Q. If you just look in the box at the top, it's on the left, five boxes down, "Date viewing commenced: 10 July 2005, 20.00 hours" and "Date viewing ended:11 July 2005, 23.30". A. [DI Ewan Kindness] That's absolutely correct. It's an error. It should have been the 10th. This leaves the one crucial and compelling question: Why were the police reviewing CCTV footage from Luton station and car park on 10 July 2005, when the accused apparently weren't identified on King's Cross Thameslink CCTV until a day later, 11 July 2005?